So remember wayyyy back two months ago when I shared this picture on Instagram and you were wondering what the heck I was working on?? My mom has been wanting to update a few things in my parents' bedroom for a long time. In November, I got a chance to go stay with her for a few days so we could work on a couple of projects. The main one was their dressers. They've had two mismatched dressers in their room for a long time. These dressers have been part of the household for as long as I can remember! They are great, sturdy wooden pieces, but they both desperately needed an update. My mom also wanted them to be painted similarly so that they would like they were meant to be together! After discussing her tastes and decorating style, we decided to go with a distressed look. My mom wanted to use grey paint. I decided to surprise her by adding a little pop of color. My mom loves color, and it shows throughout her home. Her bedroom has lots of different shades of purple, so I decided purple would be the best option. Here are the dressers, in all of their glory. Fancy, huh? These dressers used to be in the bedrooms of my sister and I back in the 90s! So it was definitely time to get to work! 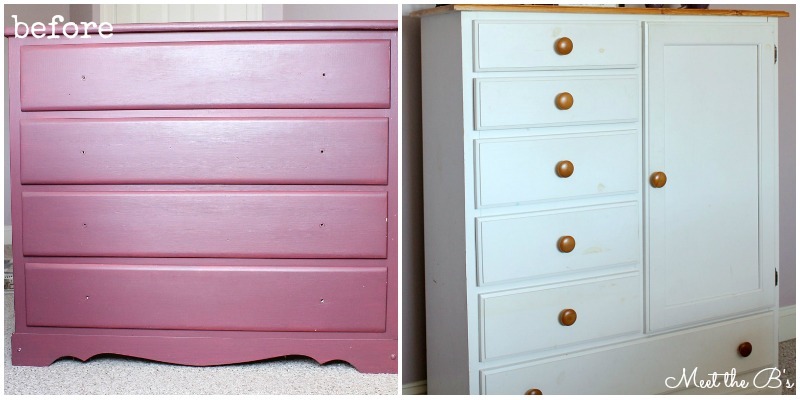 The first thing I did was paint both dressers and all of the drawers with two coats of paint. 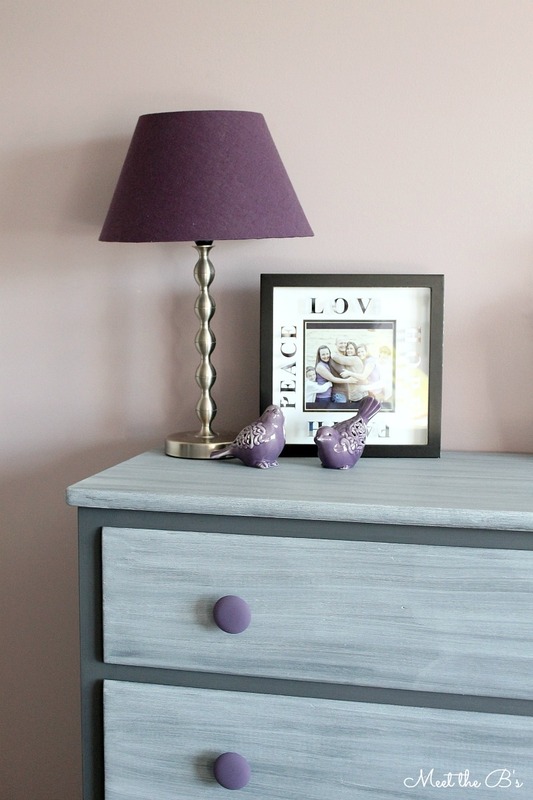 I used Americana Decor's Chalky Finish paint provided by DecoArt in the color "relic." 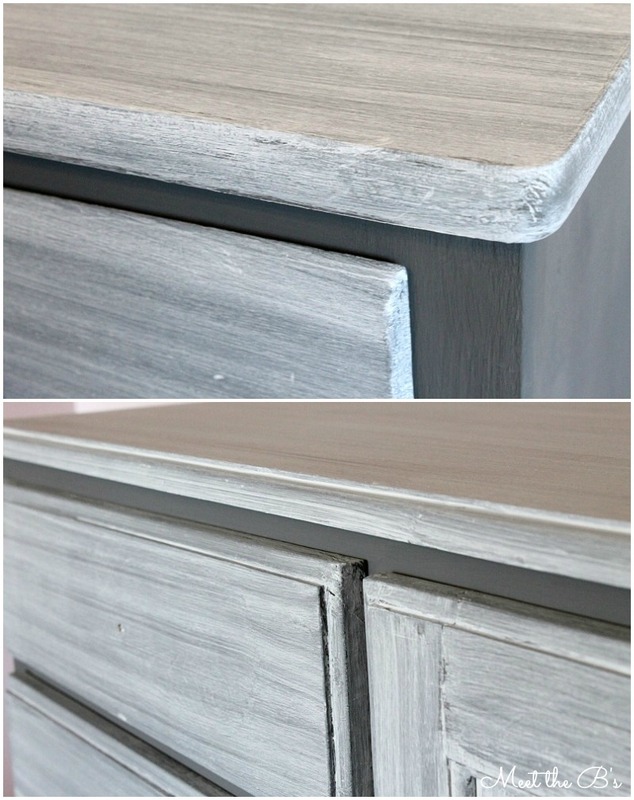 Chalk paint is perfect for furniture makeovers because it requires no sanding ahead of time and goes on so smoothly! Next, I used a white washing (in this case, grey washing!) 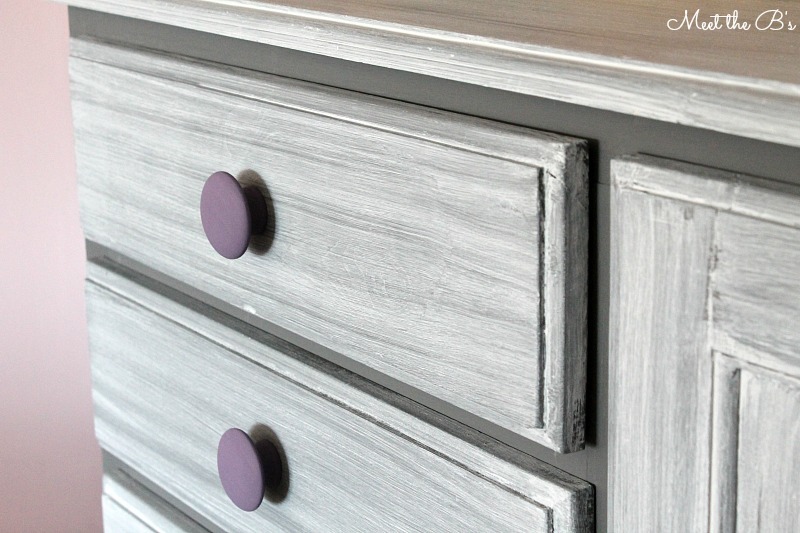 technique on the drawers with Americana Decor's Chalky Finish paint in "yesteryear." To white wash, mix your paint with water. I don't usually measure a specific ratio, but I do make it more on the watery side. 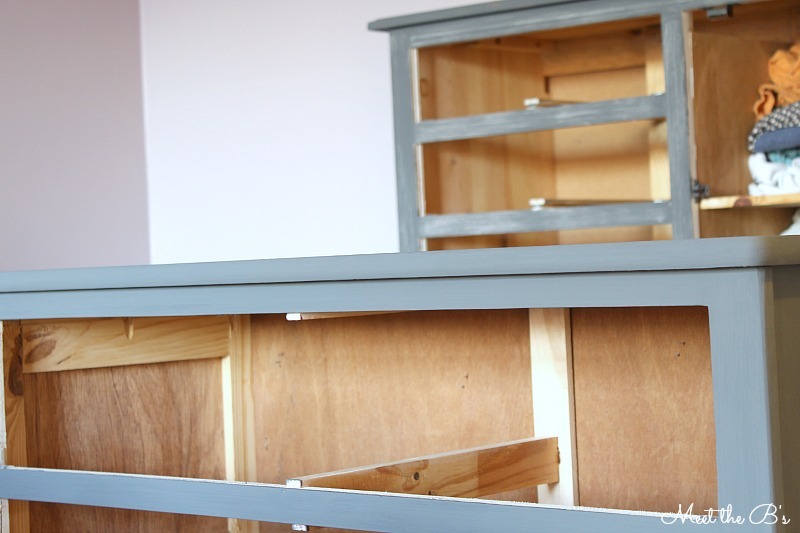 Brush a layer of the paint mixture onto the furniture, and then use a soft cloth to wipe away some of the paint to give it a streaky appearance. I prefer Handi Wipes for this because they are lint free cloths and reusable (just rinse thoroughly and let air dry!). I recommend wiping in the direction of the wood grain for a more natural look. 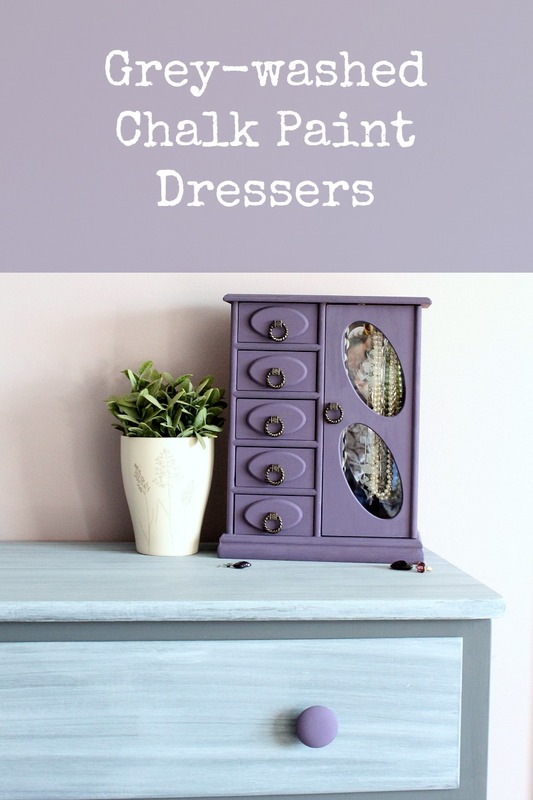 Work quickly because chalk paint dries fast! Once dry, I gave the entire thing a coat of Americana Decor's Soft Touch Varnish. This is especially important on the top surface and the drawers since these areas get used frequently. Now, its time for that pop of color. Remember that Instagram photo? 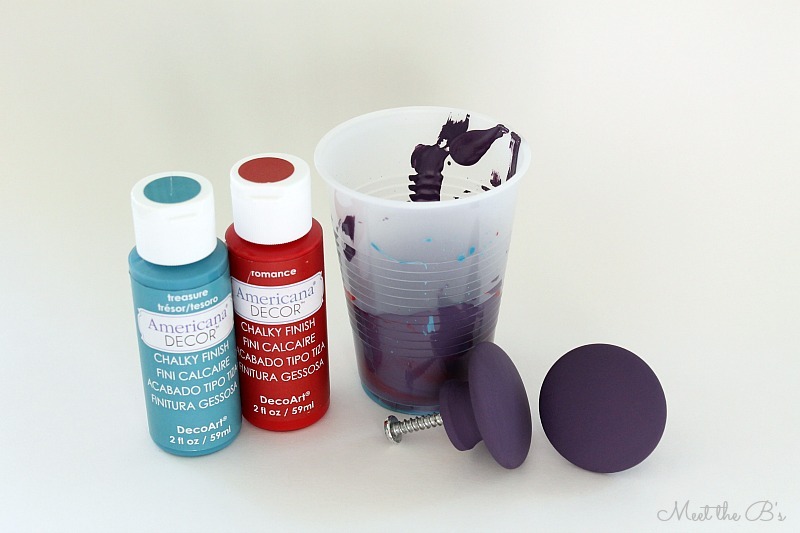 Did you know DecoArt provides color mixing instructions on their website? While DecoArt offers many colors in their Chalky Finish paint, they didn't have the purple I was looking for. However, in their mixing guide they did have a deep purple that was perfect! Following their instructions, I mixed three parts "treasure" to one part "romance." 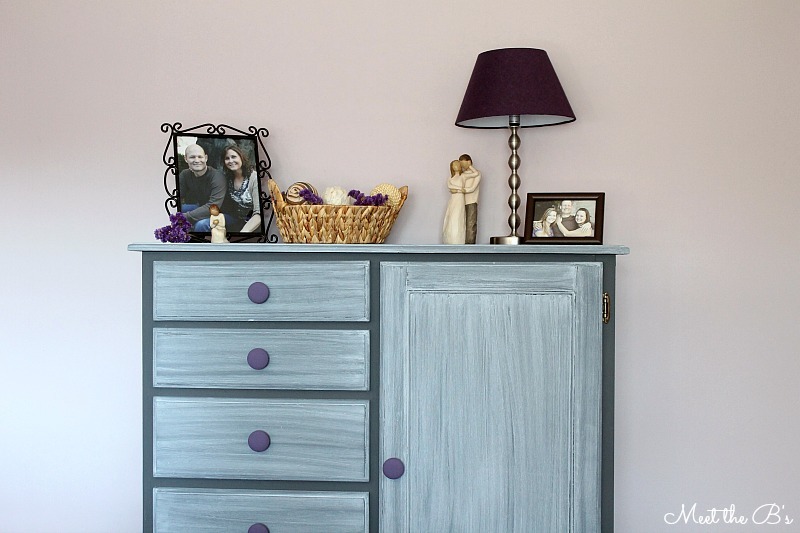 I gave the dressers' original wooden knobs a coat of my newly mixed purple paint! The updated dressers look perfect in my parents' room! I really love how they turned out! *This post contains gifted products and affiliate links. See my disclosure policy. Nicole! I LOVE everything about them!!! The colours are perfect and the whitewashing looks fantastic!!! Your Mom must LOOOOOOVE them! Great job my friend! Thank you Kristi! I really love how the colors turned out! Thank you! I would love to see what you're working on! You did a fabulous job Nicole! Love the colour! 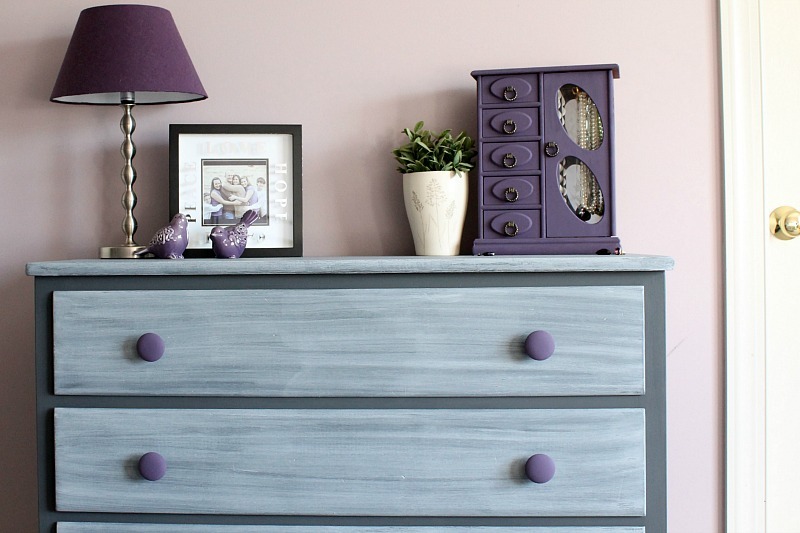 Love the purple knobs! So much fun... your mom is one lucky lady! Thanks!!! I love the little pop of color they add! This turned out great love the look! Wow! These are so beautiful! You did a great job. I just love this paint line. That purple is amazing, too. Thank you!! I love this paint too!!! So easy to work with! Hi Sherri! Thanks for stopping by :) They make special brushes for chalk paint that you can get at most craft stores or online (try Amazon! ), but I've always had fine luck with a regular good quality paint brush with fine bristles. The chip brush will definitely work well for the white!